Why are gym backpacks essential? Well for one, it helps you put your best foot forward. Did you know that 57.25 million Americans paid for a gym membership in 2016? That means that you can potentially meet one in every six people at the gym. A good gym backpack can help you properly prepare for all of your workouts. Stop looking at gym backpacks as merely something to put your things in and start thinking how it would make you more stylish and comfortable. No gym bag will be able to improve your workouts, but the perfect bag should make your life a whole lot easier, especially if you are going to the gym multiple times a week. Gym backpacks are pretty much alike. Most of the time, gym bags tend to have water resistant material, a spacious main compartment, and some pockets. However, your gym bag should always align with your lifestyle and personal fashion sense. The perfect one should accommodate all of your stuff. Also, it should be durable and well within your budget. The gym backpacks we chose all have these characteristics. Prices for the best gym backpacks vary widely. You can get one for less than $ and still get an excellent bag for your needs. Or you can pay for more pricier brand name bags that offer more durable materials and better designs. Overall, you can expect to pay anywhere from $ to $. What can you expect from these gym backpacks? These bags should not only help you bring everything you need for your workout and after that, but also be comfortable enough to carry around. What's more, these bags are also very versatile, you can use it as a gym bag, or as an everyday bag, or even take it on short adventures. To come up with this list of recommended gym backpacks, we pored over the recommendations of several sources such as Business Insider and WomensHealthMag.com. We also looked at each gym backpack's product information page, as well as online retailers such as Amazon, BestBuy, and DicksSportingGoods.com. What are the best gym backpacks you could buy now? This Adidas backpack is an excellent way to bring more style into your gym time. It has a spacious main compartment that you can use to carry everything, including your gym clothes. You can keep your items safe with the dual buckle closure and the drawstring top, while the mesh back panel allows your back to breathe. This backpack comes in three colors: black, gunmetal, deep burgundy. You would also love the comfort you get from the breathable back panel and the adjustable shoulder straps that are padded for comfort However, this backpack does not have too many compartments. It does have water bottle pockets and an interior media zip compartment, but that's it. This nylon backpack measures 11.5 by 14.5 by 4.25 inches. Further, it costs anywhere from $ to $ depending on the variation you choose. It has a 4.5 out of 5.0 stars rating on Shop Bop. Adidas has a lifetime backpack and bag warranty. Sleek, stylish and comfortable to carry around, the CALIA by Carrie Underwood Dome Backpack is meant to be versatile. You can bring the Dome Backpack to your workouts, then attend classes or meet friends for brunch. It also comes with adjustable straps and a mesh back for a comfortable time lugging it around. Additionally, there is a laptop sleeve in the large main compartment, while front zipper pockets exist for smaller things that you want to keep safe. Made with PU and neoprene, this backpack measures 11.8 by 17.3 by 7.9 inches. Prices for this backpack starts at $ to $. It has an overall rating of 3.2 stars out of 5.0. The Aurorae Yoga Multi-Purpose Backpack measures 12.6 by 21.2 by 5.1 inches. Overall this backpack has a 23-liter capacity for your things. Made with heavy-duty fabric, you can quickly secure your yoga mat in the center using the mat lock system, keeping the main compartment free for your other stuff. The shoulder straps are adjustable and well padded to ensure comfort. Inside, you have a small mesh pocket where you can securely place your valuables. Two mesh pockets are found at the side for water bottles. 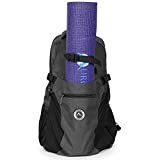 Pricing for this top-loading yoga backpack ranges from $ to $. It is rated 4.1 out of 5 stars, indicating that most customers love it. Some users, however, complain that the bag does not hold a yoga mat well enough, so that it keeps on flopping to one side, hitting some people that you meet. You can choose between two colors: purple stripe and snow. The North Face Women's Jester Backpack has a huge main compartment that can accommodate your gym clothes, books, and other stuff. The backpack also features a tablet sleeve and several zip pockets. On top of these, it also has elastic bungee cords upfront that gives you more storage. Further, there are two water bottle mesh pockets and water bottle tabs. Carrying this backpack will be very comfortable, thanks to the padded mesh panel and a lumbar panel that is breathable as well. Amazon customers love this backpack with its customized shoulder straps and padded mesh back, giving it an aggregate rating of 4.4 out of 5-stars. However, some customers think that this backpack could be better, wishing it were a bit bigger to be used for school. 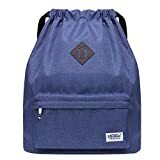 This polyester backpack measures 19.3 by 12.5 by 9.0 inches and comes in a variety of colors including asphalt gray, atomic pink, and blue coral among many others. Pricing ranges from $ to $. If you want a bag that can carry everything you want to bring, then the Speedo Tri Clops Backpack might be the one for you. This backpack can accommodate up to 50 liters of your stuff. Measuring 20.5 by 13.5 by 3.5 inches, you can put swimwear, wetsuits, and footwear inside. Some of the features you would love include the many compartments and sections for your things, the comfortable straps, and the ergonomic back panels. The backpack is also very durable with the 100 denier nylon material that it uses. The bag is not perfect, however. For instance, it is quite big and may not be suitable for every adventure. It would have been better to have zippered sections that would collapse or expand the backpack as needed. This backpack is just perfect for triathletes and gym buffs. 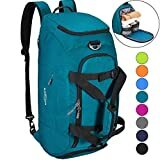 Pricing for this backpack ranges from $ to $. It has a 4.6 stars rating out of 5.0 rating. The UA Hustle 3.0 Backpack has a water-resistant finish that helps keep it safe no matter what the weather is. Its durability features do not stop there as you will also enjoy the scratchproof bottom panel. That part has enough space for your wet clothes or shoes, while the sides have pockets where you can store your water bottles. It also has front pockets to keep your smaller valuables safe. This backpack has a 30-liter main compartment that features a 15-inch laptop sleeve. It also has a water-resistant finish plus a scratch-proof bottom panel. Additionally, you have 20 color choices for the Under Armour UA Hustle 3.0 Backpack, including black, green, and blue. Further, the 100 percent polyester backpack measures 9.3 by 18.9 by 13.6 inches. Some reviewers on Amazon, however, complained that the material this backpack uses could feel cheap. Nevertheless, it still gets a rating of 4.5 out of 5.0 stars. The G4Free 3-Way Travel Duffel Backpack Luggage Gym Sports Bag is an adaptable backpack that you can take anywhere. It uses a tear-resistant and splash-proof nylon fabric and top quality zippers that ensure you would be using this bag for a long time. It is also comfortable with its adjustable straps and breathable mesh covering the back part. There are also several pockets, including a shoe compartment. Further, you will love the included carrying pouch, which allows you to store the bag when not in use. The 40-liter bag is very lightweight and measures around 23 by 12 by 10 inches. It gets a high rating from customers on Amazon, garnering a rating of 4.3 out of 5.0 stars. Some reviews on Amazon, however, point to the low quality of the material and construction of the bag There are four colors to choose from: black, cyan, green, and orange. The price of the bag ranges from $ to $. The KAUKKO Drawstring Sports Backpack Gym Yoga Sackpack Shoulder Rucksack uses a water resistant canvas fabric with a polyester lining that gives it a durable and elegant look. It is very light and carrying it is no problem. You can even adjust the wide shoulder strap that also doubles as the drawstring. This bag has a main compartment that can accommodate a basketball. With its comfortable shoulder strap, this waterproof and durable gym backpack has several pockets to keep you organized. However, there are complaints that state the bag is difficult to open. Further, there is no easy way to adjust the straps. The backpack might fall very low when you put too many things inside. As a result, the bag will keep bouncing off your buttocks. There are more than two dozen color options available, including black, gray, and green. This backpack measures 12.59 by 17.71 by 5.9 inches, and prices range from $ to $. Further, it has a rating of 4.3 out of 5.0 stars. 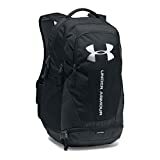 The AmazonBasics Ultralight Packable Day Pack is a versatile, lightweight, and durable backpack with adjustable straps and enough space for your clothes and other stuff you bring to the gym. It has several pockets so you could organize your things. You can also use the two mesh side pockets, perfect for those times when you want to bring a raincoat or an umbrella as well as a water bottle. Choose from a variety of colors and between two sizes: 25-liter and 35-liter backpacks. You can also fold this bag and hide it away into a pocket-sized sleeve for easy storage. However, because it is foldable, this backpack offers you no structural support, and it will take the shape of anything that you place inside it. This nylon fabric backpack measures 11.5 by 17.5 by 7.5 inches and is priced at $ to $. You can buy this from, well, Amazon, where it has a rating of 4.2 stars out of 5.0. The Adidas Sport ID Clip Pack has comfortable shoulder straps that you can adjust so that you can comfortably carry it around. The bag has a very spacious main compartment, while also providing some pockets for smaller items such as water bottles, smartphones, and wallets. You can even bring an extra pair of shoes or a change of clothing. However, this bag uses a clip closure, which some people might find less convenient to use than a zipper. This water-resistant polyester bag measures 13.0 by 19.5 by 4.5 inches and is priced anywhere from $ to $. Further, Amazon customers have rated it with a 3.9 out of 5.0 stars. The perfect gym backpack would differ from person to person. 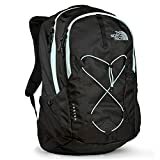 Women would probably want the North Face Women's Jester Backpack with its comfortable strap and roomy main compartment, as well as the tablet sleeve and several pockets. Meanwhile, the men will want the G4Free 3-Way bag which can be a travel bag, a duffel bag, and a backpack all in one. You might also want to choose gym backpacks that are more suitable for your needs. If you crave outdoorsy adventures, you can make your Under Armour UA Hustle 3.0 Backpack do double duty as a gym bag and as your companion when you scale mountains. If you do yoga, then get the KAUKKO bag.